Today adidas is proud to show the world the ball that everyone will want to get their hands on. The adidas Finale Berlin - the Official Match Ball for the knock-out stages and the Final of the most prestigious club competition in global football – has arrived. Now that the UEFA Champions League is about to enter its most exciting stage, the ball is ready to become the centre of attention once again, and will shine throughout the pitches of Europe; from the knock-out stages, all the way to the Final. The design was inspired by the dynamic, young and hip scene of Berlin. The top star includes one of the most recognisable symbols of the city: the Brandenburg Gate set in front of the legendary Olympiastadion Berlin, the setting for this year´s ultimate UEFA Champions League showdown, which will take place on Saturday 6th June. The surrounding stars on the ball each have a bold and colourful design,including the other key Berliner symbol: the bear. The vibrant mix of colour is also typical of the the expressive, artistic and free spirited German capital city. The Finale Berlin will also be showcased in this week´s Gamedayplus episode, the 7th of the series, which will include an exclusive stadium tour at Chelsea with none other than star defender Gary Cahill. The instalment will also give a special behind the scenes look at the shooting of adidas most recent ´There will be Haters´ campaign advert, featuring Leo Messi, James Rodriguez, Luis Suarez, Gareth Bale, Benzema. To cap it off adidas had a chat with FC Basel´s Fabian Frei who teed-up the knock-out clash with FC Porto. The episode will be live as of today 20h45m CET. As with all UEFA Champions League Official Match Balls, the adidas Finale Berlin features an outer coating texture designed to provide optimal grip at the point of impact. The thermally bonded star panel design on the match ball, based on the design of the UEFA Champions League logo, provides a seamless surface and first-class performance. 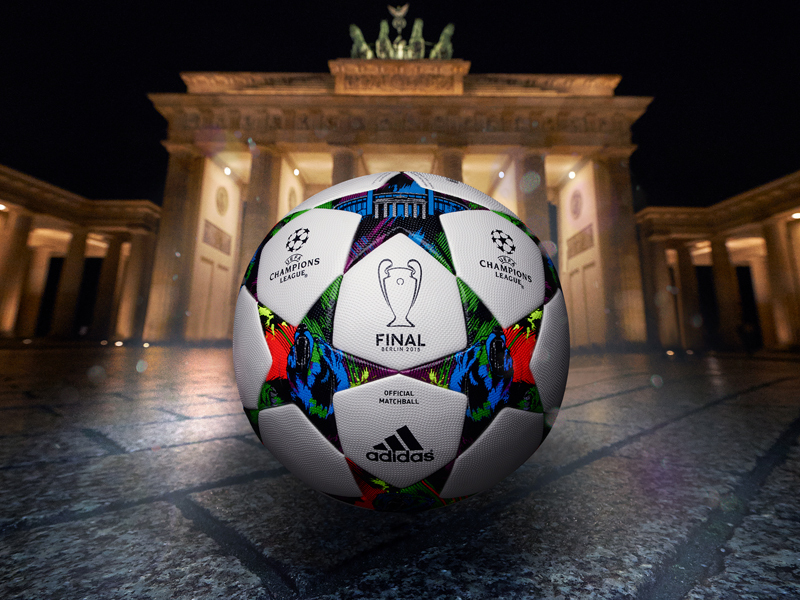 The adidas Finale Berlin ball will be used on field during UEFA Champions League matches from tomorrow (Tuesday 17th February) onwards up until and including the this year's UEFA Champions League Final. The ball is available now for purchase in selected adidas retail outlets, associated stockists and via www.adidas.com/football. Join the UEFA Champions League conversation on www.adidas.com/gamedayplus or on Twitter: @adidasfootball #ucl.